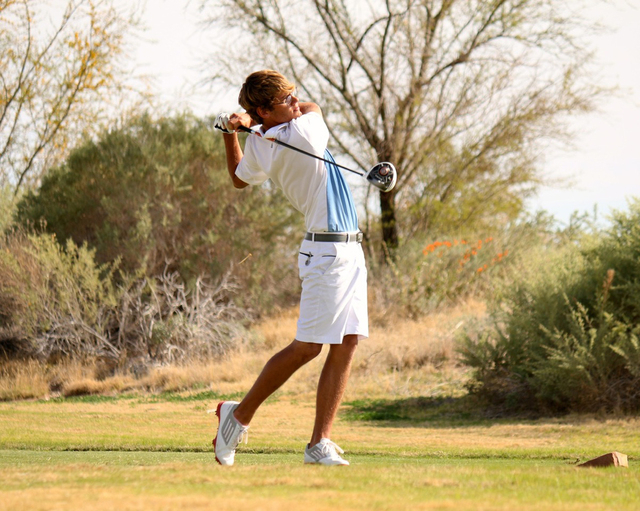 Boulder City golfer Luke Logan capped his impressive senior season by capturing a fourth consecutive region title on May 6 at Siena Golf Club. Logan, who finished second individually at state this season, recently was named the Division I-A Southern Region Player of the Year by league coaches. Logan, a North Idaho College signee, also led the All-Southern Region first team. He was joined by Faith Lutheran’s Charlie Magruder and Dallas Haun; Moapa Valley’s Jacob Causey; Pahrump Valley’s Austen Ancell and Sierra Vista’s George Kim. Ancell, a sophomore, won the Division I-A individual state championship by two strokes over Logan. The All-Southern Region second team was comprised of: Boulder City’s Hunter Ulibarri and Quentin Turner; Faith Lutheran’s Andrew Boka and Mitch Conley; Virgin Valley’s Hogan Fowles and Western’s Raymond Falkenstein. Faith Lutheran’s Mark Cheney took home the region’s Coach of the Year honors.